As I was doing my laundry, I thought of Leslie Nielson in the Naked Gun movie, one of the best movies of all time. Specifically, I was thinking of the scene where he is going through his fridge after being away for a while, and he is smelling the chinese takeout that has been in there for a couple years. Or maybe it was milk. I have to rewatch that movie. This isn’t the right picture, but it is the right look. This is the look I had when laundering my running clothes. Yikes. I guess I need to purchase more, so I don’t have to wear them more than once. Ok, maybe that was TMI. But most of the shirts I get from races are cotton, not the best fabric for exercise, so I have a small number of technical running shirts. Ok, so I do have some of those skin-tight Under Armour shirts, but I haven’t been doing any upper-body work, and those things look terrible unless you really spend some time swimming and/or doing weights. 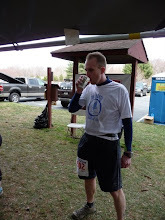 Yesterday, I ran 6 miles easy at Patapsco. But there is no such thing as easy at Patapsco. I did more hills than I should have. I was trying to recover from the speedwork I did on Tuesday. Today, I didn’t want to do too much, so I started off with a 20 minute warmup at 8:30 per mile, and then I did a one mile time-trial. I had a crazy idea that I could break 6 minutes. That isn’t so far out of the realm of possibility, since I did 6:15 on the 3rd of 4x1 mile intervals on Tuesday. I guess I wasn’t fully recovered from Tuesday, or maybe I was hungry from working too late, but I did a pitiful 6:20. No biggie, though. I’ll keep working at it, and not push too fast. I have lots of time. I’m thinking of running the Dreaded Druid Hills 10K on Saturday. I guess my goal should be to go out at 6:45 per mile, and see how that feels. If it’s too much, I’ll drop back to 7, and try to hold on to a sub 7. I ran 7:20ish per mile 2 weeks ago, and that was on trails. I think I can do sub 7’s on the road, even if it is hilly. I'm just a lowly harford county runner... but we runners hafta stick together. no marathons yet for you? I'm not a marathoner. I think running 26.2 miles on roads would be torture! Sure, I run 50Ks, but they are on trail, so it's not too hard on my legs. I could probably write more on this, but I'm in the middle of rehabbing my kitchen, so I'll write more later. Thanks for the comment!